It is said that in life we are either entering a storm, going through a storm, or leaving a storm. We aren’t promised an easy life for sure, and these storms are sure to be tough. Maybe it is an accident of some sort that has caused bodily injury. It could have happened on the job or at home. I know several people who have fallen from ladders while working on their home. In fact I know of two women whose husband’s have died as a result of these falls. Talk about the most terrible thing that could happen at that’s it. Car accidents are another sometimes awful event in our lives, and in fact this is something my wife and I recently experienced. The healing is slow but especially for Heather my wife she is getting there. Health scares with things like benign tumors that turn out to be nothing more, to more terrible diagnoses like Stage 4 cancer or a stroke will cause life to stop for a moment for sure. Over 25 years ago, my mother had an aneurysm which is similar to a stroke and ultimately died from the complications of that issue. Other things like drug and alcohol abuse can cause difficulty in a marriage for sure. In fact I see this issue quite a bit in my counseling with couples. More often than not the couple may not quite see and understand this as an issue. However, it can certainly cause high conflict, violence, depression, and financial issues just to name a few. Job loss which can cause great financial hardships is something that you may have gone through. This can cause difficulties for couples and families and can also cause hits to self esteem, depression, and anxiety waiting to find another job. Other issues like affairs which we talked about quite awhile in an earlier episode can rock a marriage and in fact many times will lead to divorce without help and work on that issue. No doubt one or more of these issues will come, and so often there may not be much you can do to prevent something like this from happening. So it is really all in how you deal with it as a couple that counts. Let’s talk about some of those ways. Mindset Shift: All too often issues and problems in a marriage are seen as well that’s “your” problem or this is “my” problem. However this can lead to feeling hurt and alone. It is better to think of these things as “our” problem and we will get through this together. Friends and Family: During the difficult times do not be afraid to lean on those people that want to help. You might not like asking for help or maybe there is a pride issue, but when you don’t take help you will prevent your friends and family from being able to give and be blessed in return. 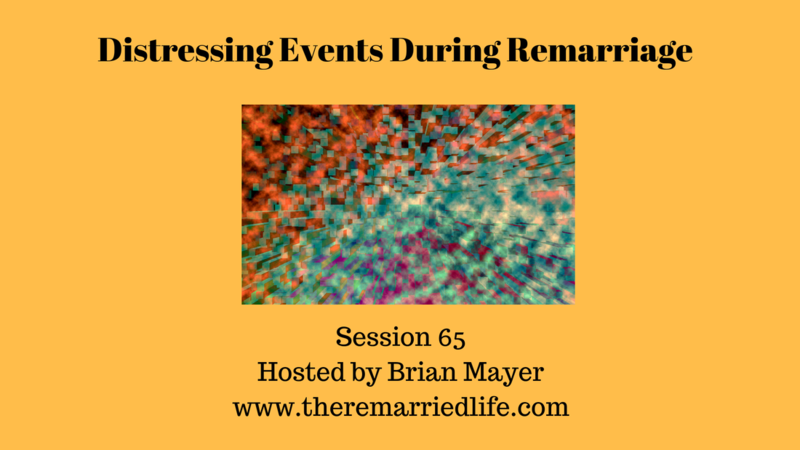 Past Distressing Events: Be sure to discuss past issues and how you both overcame them. Often when talking about everything you have overcome, you can both often draw from strengths and ways in which you solved problems together. This is a great confidence builder. Have Fun Together: This one might be the hardest because you might be overwhelmed with all that comes with a distressing event. However it is important to do something like a date night, plan a picnic, or a couples massage. You brain needs a break from time to time to help in dealing with the issues. Trust in God: For me this is the most important one of them all and the one that can sometimes be tough especially if you are in the middle of the storm. With the recent car accident we were in, God could have just as easily decided to call one or both of us home. However, he did not. We understand that eventually we will all be called home, but for some reason he chose for this not to happen right now. For us this means the we have more of his work to do here. However, for those of you that have lost a spouse or a loved one too early this trust is not as easy. We are humans and so it is very hard for us to deal with or understand why we see that some loved ones don’t get the life we feel they deserve. In my opinion, I believe God knows and understands this. He will be patient with you, so as much as it depends on you keep working on that trust. In time he usually reveals what his plan for you in all of this is.